This year for SD’s birthday,the girls ( with some help from me!) made this masterpiece,as his present. SD loved it 🙂 The best part was Ananya felt involved too..:) I let her stick a button or two as well and she loved feeling the wet paint on her hands-even wanted to taste it! 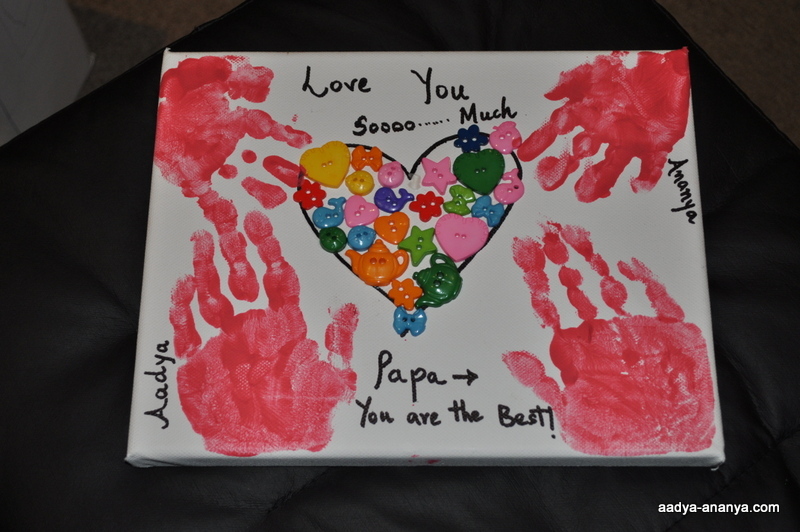 Aadya had a blast,picking ‘Just the right button’ to fill up the heart for her daddy..and hand-printing is her favorite activity,EVER! Previous Post The one where I wanted the earth to open up and Swallow me! Next Post Father’s Day that was.. Awesome.. happy birthday to SD.